Stress Balls- All You Need To Know Before Buying It. Stress balls are one of the best ways to ease out your stress. This blog post will be a detailed one so friends please bear with me. I will start from scratch and will try my best to help you guys understand the real importance of stress balls. You can buy the best quality of stress balls at Amazon. How To Use Stress Balls? Where To Buy Stress Balls? Trust me guys, like you, this topic is very new to me as well. Before I decided to write about stress balls I had to do lots of online research to do justice to this piece of article. My research started on Wikipedia, moving further to some research paper and finally ending up on Amazon. It took me a hell lot of time to decide which stress ball should I promote? The best part was that I understood one thing very well. Do you know what I mean? Stress balls really work buddy. So, a stress ball or a hand exercise ball is just like any other ball which can be squeezed in hand and also can be manipulated by fingers, to generally relieve the tension of the finger. Many people use it for exercising and building hand muscles. I have preferably used it few times for easing out my hand stress. Do you know that all stress balls aren't spherical? Many of them have different shapes and have corporate logos embedded on its surface. You will be astonished to know that stress balls are the third most promotional gift in the United Kingdom. Again an interesting fact, different shapes and sizes of stress balls originate from different countries. In America, the most common type of stress balls is bean bag types named hacky sack. In Australia, mostly you will find foam type of stress ball. If we talk about China, then again the Chinese form of the stress ball is known as Baoding ball. Stress balls are nowadays used a lot in physical therapies and these balls contain different densities of gel inside the rubber or cloth peripheral or skin of the ball. Let's introduce you guys to a stress ball that can even be made in the home. These kinds of stress balls contain baking soda inside the balloon. It's not so hard to make stress balls at home. In case you are also one of those who is looking for the techniques of making stress balls at home then you have landed at the right place. The things that you will need for making a stress ball are three balloons, flour or rice, scissor, funnel. Blow the balloon to the full capacity. Now choose your filling-rice or flour. Moving further, stick a funnel into the neck of the balloon. Now with the help of the funnel, pour flour or rice in the balloon. The process of pouring should be slow. Remove the funnel from the neck of the balloon and try to let out as much air as you can from the balloon. The neck of the balloon should be tied closed tightly. Now take the second balloon, snip off the end and perform the same process for the last balloon as well. Now tie the end of the balloons and yes your squishy stress ball is ready for you. You can also buy a squishy stress ball at the best price from Amazon using this link. Before we move to the next section, kindly read the handpicked articles related to stress management techniques. I will try to answer some of the questions asked by my readers. The answer is YES. If the stress ball wasn't of a great benefit then definitely I wouldn't be writing this article. Now, let's understand it in biological terms. You know we get physically clenched whenever we get stressed out. The stress ball prompt you to squeeze and relax.While squeezing our body releases certain kind of hormones which help us to get relaxed. Where do we get stress ball? You can find the stress balls at Amazon. What is filled inside stress balls? Let's divide stress balls into two types-homemade and commercial. If we talk about homemade stress balls then it is generally filled with flour or rice or something similar to it. Now, if we talk about commercially made stress balls then they aren't filled with anything as such. Mostly these balls are made from polyurethane closed-cell foam rubber. What makes stress balls different from one another? I can understand there are a wide variety of stress balls available at Amazon and other similar e-commerce websites. At times it becomes really confusing to understand how these stress balls are different indeed. The answer is very simple-density and durometer are the deciding factors. In case of a stress ball, density will refer to hardness or softness. Durometer measures density on the hardness scale. So a higher durometer reading implies the stress ball will be difficult to press as compared to the one with low durometer reading. What are the constituents of stress balls? The constituents of stress balls-Skin and Fillers. As the name suggests, Skin is the term given to the outer portion of the stress ball. Mostly these are made up of cloths or rubbers. If we talk about Chinese Baoding balls then they have glass or metal as the skin. The other constituents are fillers. These are generally bean, rice, synthetic materials or DIY slime. Fillers plays a significant role when it comes to the softness of the stress ball. What are the exercises that can be done using stress balls? There are many exercises that we can do using stress balls. 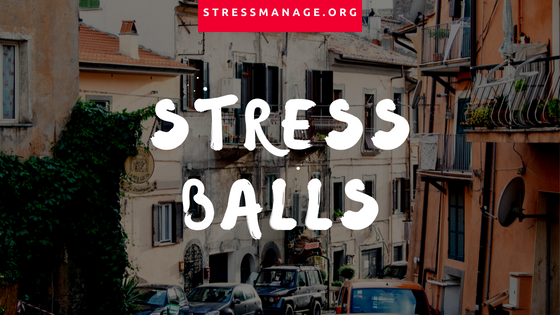 I will be discussing here FIVE exercises that are good to do using stress balls. I have personally used these exercises and the benefits have been mind-boggling. I recommend you to try these exercise on a regular basis and make it a part of your daily routine. Finger Grip-This exercise is performed by pinching the ball in between your thumb and each finger individually and performing this exercise for each finger five times. Palm Press-As the name suggests, press the stress ball between your palm and keep your forearm vertical. Repeat this exercise for 10 times. Full Grip: In this exercise, you have to squeeze the ball for a count of five and then release the ball. Perform this exercise for at least 20 times. Ball Rolling-To do this exercise in the best possible manner, you need to use Chinese Baoding balls because it will help you to roll the stress ball in your hand. As compared to the traditional stress balls these balls are firmer and help energy meridian in your hand to get massage properly. Thumb Press-Place a stress ball in the palm of your hand and then press it with the thumb pointing towards the little finger. Hold this position for 5 to 7 seconds and then relax. Repeat this method for 10 times and then relax and further do it with another hand. What are the popular and most useful stress balls? Emoji Stress Balls-I better call these balls as laughing balls. A very popular stress ball among women and youngster.I have seen children running behind this stress ball.This ball is awesome and very safe for children. Stress Balls On A String- It's again another promising stress ball.As the name suggests, stress ball is attached to string which helps you to answer a call or a door bell without discontinuing the stress relief exercise. Sports Themed Stress Balls-These stress balls are generally good for the sports enthusiastics who can enjoy the flavor of game while doing some stress relief exercise. Humorous Face Stress Balls-The stress balls are in the shape of humorous balls and it's really great to have this kind of balls in your stress control toolkits. Personally, I have been using this stress balls and trust me I literally enjoy doing stress relief exercise with especially this kind of stress balls. Earth Stress Balls-This kind of stress balls will have the map of the earth built on the circumference or outer skin of the stress balls.Definitely, a good choice. A Whole Box Of Stress Balls-Generally a whole box of stress balls are needed in corporate environment.It can also be used as promotional stuff. What are the benefits of using stress balls? Best way to relieve tension, stress and anxiety. Building hands and arms strengths by mode of physical therapy. Massaging the bottom of your feet. Diverting your attention or distracting yourself. Helps in preventing repetitive motion injuries. So moving to the next section, we will talk about five unique stress balls.These uniques stress balls will not only help you in relieving stress but can also be used in other mode of exercise. Color Changing Gel Stress Ball- These stress balls are very unique in nature.As the name suggests, these stress ball changes color whenever the ball is squeezed.Trust me Guys, it's a wonderful feeling and you will definitely love this kind of stress ball.It's a real fun to relieve your stress usig this kind of stress ball. Gripp Original- It's 100 percent bio-degradable product.This stress ball is also called green ball.It doesn't produce non-degradable waste.I will recommend this stress ball to all those individuals who are serious about the mother planet earth.We should definitely say NO to plastic, polythenes and other plastic polymers. Gripp Gravity- A one of its kind.This stress ball is popularly known to give a great strength to your fingers and wrist.It's 100 percent bio-degradable.The best part about this stress ball is that it not only helps you in relieving stress but at the same time it also gives you a mini workout. Conclusion:I hope you will definitely use stress balls to relieve your stress.